BUSINESS KPIs – WHAT ARE THEY? In this blog, I’ll be looking at KPIs, giving you some definitions, and explaining why they are relevant. 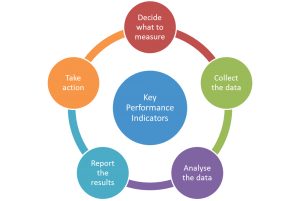 KPI stands for ‘Key Performance Indicator’. You may have also heard of KSIs, which is the same but is short for ‘Key Success Indicators’. They’re important for every business. They identify what you should be measuring, so that you know whether or not your business is achieving its objectives. KPIs are an actionable scorecard that helps you keep your strategy on track. They let you manage, control and achieve desired business results. The KPI target could be a number, a ratio, or percentage. KPIs can be internal or external. Internal KPIs are used by teams or departments to measure their own performance and may not necessarily be reported to the senior management or clients. These KPIs don’t need to impact on, or be linked to, profit margins. External KPIs are should be directly linked to your business’s profitability and your bottom line. They are reported to senior management, and potentially clients, as a way of showing the business is performing to plan. You can have high-level and low-level KPIs. High-level KPIs look at the company’s performance. Low-level KPIs measure departments’ or individuals’ performance. Communicated clearly to your staff, so they can act on, and improve, them. You’ll need to work with key members of staff to identify what needs to be measured, and to put processes in place. It’s also important to ensure that staff members are engaged in the process and take ownership of the KPIs. I have talked about SMART objectives in other blogs. KPIs have to be Specific, Measureable, Attainable, Relevant and Time-framed. If you expand this to SMARTER criteria then you can add Evaluate and Re-evaluate. You should revisit your KPIs regularly to check their relevance to your business and whether they need to be changed. I’ll go into greater detail and give some more examples of good KPIs in another blog.